The 2013 IMO Award for Exceptional Bravery at Sea will be awarded to two US Coast Guard rescue swimmers credited with saving the lives of 14 crewmembers from the tall ship HMS Bounty, the International Maritime Organization has announced. The IMO Council, meeting for its 110th session in London from July 15-19, decided that the 2013 award will go to Aviation Survival Technician Second Class Randy J. Haba and Aviation Survival Technician Third Class Daniel J. Todd of the United States Coast Guard Air Station Elizabeth City, North Carolina. They were nominated by the Government of the United States for saving the lives of 14 crewmembers from the tall ship HMS Bounty during Hurricane Sandy. The Council also agreed to bestow the 2013 Award posthumously on Jinguo Yang, a crewmember on the ferry Tong Chang Qi Du 11, nominated by the Government of China, who died while trying to rescue a person in distress on the ferry, after it had collided with the cargo ship Shun Qiang 28. Aviation Survival Technicians Haba and Todd were dispatched on board two Coast Guard Rescue Helicopters, CG-6012 and CG-6031, from United States Coast Guard Air Station Elizabeth City, North Carolina, responding to a distress alert from HMS Bounty, during the pre-dawn hours of 29 October 2012. After flying through the outer bands of Hurricane Sandy, in strong winds and torrential rain, they encountered the ship, partially submerged with a large debris field, surrounded by life rafts. Rescue Helicopter CG-6012 was the first to arrive at the scene, and AST Haba was lowered into the stormy waters. He spent an hour battling strong currents and 10 meter waves, in the wind and rain, taking survivors from the life rafts to the waiting rescue basket, overcoming exhaustion and fatigue. At one point, he was engulfed by a huge wave that knocked his mask off, severely restricting his vision and further hampering his tremendous efforts. AST Haba demonstrated the utmost determination and perseverance, performing two more rescues without the use of a mask. He exhibited exceptional strength and endurance throughout the entire rescue. Rescue Helicopter CG-6031 arrived 30 minutes after CG-6012, and AST Todd was immediately deployed into the turbulent sea to begin the task of reaching another life raft. He began retrieving each of the survivors from the raft and delivering them to the rescue basket. Whilst he was assisting the second survivor into the rescue basket, a large wave toppled the life raft containing the four remaining survivors. Todd immediately secured a handhold on the sea anchor to stabilize his position. His strength and ingenuity expedited the rescue of the six survivors and his action saved valuable time. This enabled him to reposition himself to a second life raft, containing three additional survivors, whom he also successfully rescued. On 15 March 2012, the ferry Tong Chang Qi Du 11 collided with the cargo ship Shun Qiang 28 on the Yangtze river. The ferry’s hull was damaged and it started sinking with 33 persons on board, 31 of whom were subsequently saved during the search and rescue operation and transferred to a rescue ship. One passenger was trapped in his truck, which had been severely damaged in the collision. One of the rescued crewmembers, Mr. Jinguo Yang, 55, jumped back onto the sinking ferry and attempted, unsuccessfully, to pry open the jammed door of the truck in order to rescue the trapped passenger. Unfortunately, the ferry lost its stability and capsized. Mr. Jinguo Yang was unable to save the passenger’s life; indeed, in trying to do so, he lost his own. Although he had the opportunity to escape at the last moment, he chose instead, at the cost of his own life, to stay and attempt to rescue the trapped passenger. 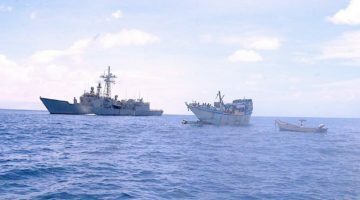 The winners of the 2013 Bravery at Sea were chosen and unanimously endorsed by the IMO Council from a total of 34 nominations from 10 Member States and two non-governmental organizations. The Council also decided that, of the other nominees or groups of nominees, six should receive Certificates of Commendation and 12 should receive Letters of Commendation. The Awards ceremony will take place at IMO Headquarters, on Monday, November 25, 2013, at the end of the first day of the 28th Assembly of IMO.